CAIRO - Muslim groups in Malaysia are offering their help to prevent any further attacks on Christian places of worship amid a spree of attacks on churches in the multi-ethnic, Muslim-majority Asian country, The Star reported on Sunday, January 10. "We don’t want our Christian brothers to be in danger." PPIM is one of 130 Muslim NGOs that vowed to become the "eyes and ears" of the government to shield churches against attacks. Seven churches have been fire-bombed or vandalized since Friday in an escalating row over a court ruling allowing Christians to use the word "Allah" as a translation for God in their publications. 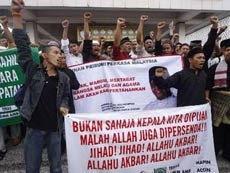 The High Court overturned two weeks ago a government ban on the use of the word "Allah," stirring protests by many Malay Muslims. The NGOs would be offer volunteers who would be on the look out for any suspicious behaviors and alert the authorities. "What is important that these people know that they are watched," insisted Nadzim. The initiative would begin in the capital Kuala Lumpur and the state of Selangor, but could be expanded to other states with the help of more NGOs. Christians make up around 9.1 percent of the population in Muslim-majority Malaysia, including a Catholic population of nearly 800,000. The church attacks were condemned by all sections of society. Seeking to quell the tensions, the government will be sponsoring an interfaith dialogue, reported the Malaysian Insider. "My department would be holding closed-door interfaith dialogues or discussion," Koh Tsu Koon, Minister in the Prime Minister's Department, told reporters. The government had already met religious groups separately but will soon hold a meeting with the different leaders privately. "We will hold closed-door meetings among the leaders first because it is important to arrive at certain common denominators of understanding." Apart from the government efforts, other faith groups like the Institut Kefahaman Islam Malaysia (Ikim) led by former premier Abdullah Badawi has already started a religious dialogue of its own. The government said the vehement condemnation the church attacks drew from all sections of society showed they do not represent the majority of Malaysians. "The way that the vast majority of Malaysians [have] responded actually gives us great hope," Koh said. "It is very often in the times of trial like these that we discover our true commitment."